Palace of Versailles wedding is a dream for many couples around the world. Don’t all the little girls dream of being a princess and having a royal wedding in a palace? Don’t all the grown-up men want to be as powerful as Louis XIV once was? Hosting a Versailles wedding is totally possible with Magic Day. Wedding day is a celebration of love, and while preparing to this celebration, every couple looks for a venue which would declare their social status through their marriage. 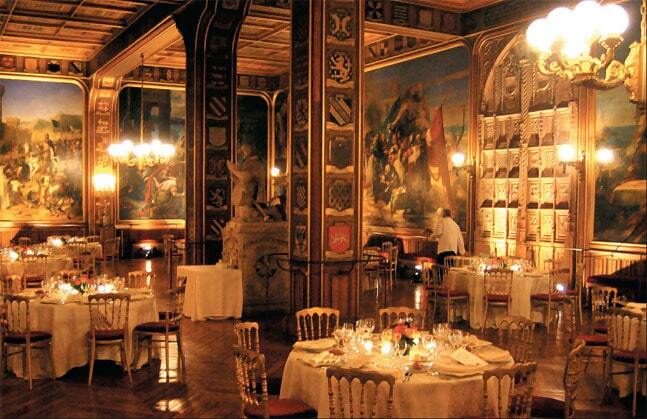 Among all the spectacular wedding venues in France, chateaux inspire romance like no others. And among all the grand French chateaux, Versailles, the Royal Domain, is the gem of the crown. Celebration in the Versailles wedding hall will be the grandest statement for all your guests. This majestic venue will bring a genuinely royal atmosphere to your wedding. The Palace of Versailles is the central part of a complex that housed the French government and royalty, during the reigns of the famed “Sun King” Louis XIV and his descendants, Louis XV and Louis XVI. It ceased to be the permanent royal residence after the French Revolution in 1789. Versailles Palace was built to impress. “Versailles is a mirage, a sumptuous and theatrical entertainment. It is also a manifestation of glory and power imposed to a great extent by art, luxury, and magnificence” writes in her book Valérie Bajou, the curator at Versailles. It is located about 16 kilometres south-west of Paris, in the heart of Versailles town. This town used to be little more than a hamlet before the construction of the palace by Louis XIV. By the time of the revolution it already had a population of more than 60,000 people, becoming one of the largest urban centers in France. 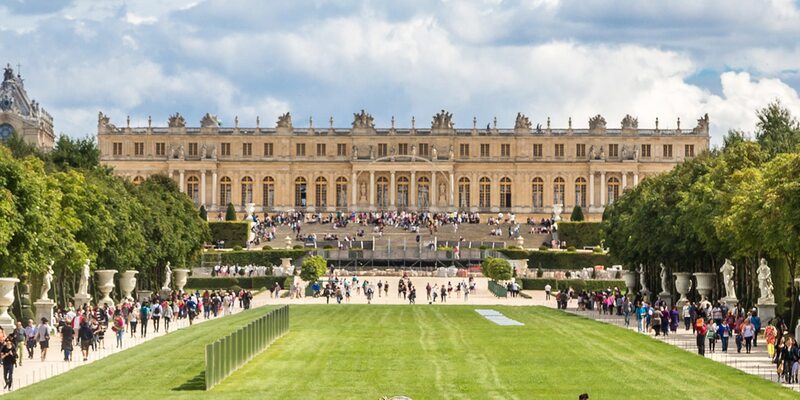 Before the revolution, the Versailles complex included the palace, gardens and a walled-in royal hunting ground. There is as well a smaller palatial structure known as the Grand or Marble Trianon and an estate used by Marie Antoinette, Louis XVI’s queen. The palace is decorated with an abundance of priceless paintings and sculptures. The interior decoration goes far beyond imagination. The ornately designed rooms including the famous Hall of Mirrors are sparkling with gold and crystals. Versailles Palace construction included several technological innovations of its time. The most famous one still attracts thousands of tourists each year and can add a special touch to your Palace of Versailles wedding. Sculptured water fountains in its gardens use pressure to orchestrate the jets of water in the air. The fountains can be activated for you and your guests to make your private visit the beautiful park a real fairy tale. 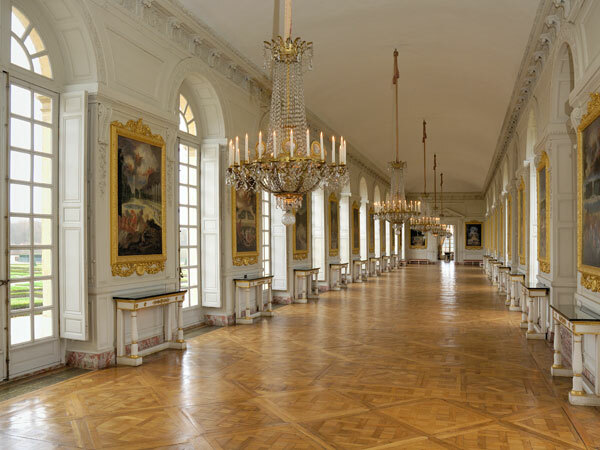 Your Versailles wedding celebration can take place in the elegant Cotelle Gallery of Grand Trianon. The Gallery opens onto manicured gardens on both sides. It is named after Jean Cotelle, whose paintings decorate the walls depicting Versailles’s Park and Groves in the reign of Louis XIV. The gallery occupies the right wing of the Grand Trianon, the marble palace set in superb gardens. 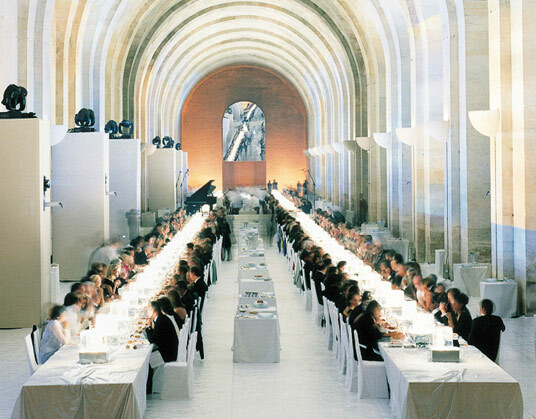 The Cotelle Gallery has a capacity of 250 people for a seated meal and up to 400 people for cocktails. The Gallery boasts excellent acoustics perfect for music performances. This is the most popular Versailles wedding hall. The vast and luxurious Gallery of Battles was created by King Louis-Philippe in 1837. The monumental room is sized 120 by 13 meters runs the entire length of the first floor of the South Wing. The gallery can host corporate and private functions, seated meals and cocktails for up to 800 guests. The walls are sparkling with gold and are decorated with 35 legendary paintings illustrating the important military events in the history of France. The Orangerie was built in the seventeenth century to house rare trees and shrubs in the winter months. It is a spacious building forming the retaining wall below the South Parter. Two huge staircases called the One Hundred Steps lead to the Orangery’s three galleries. The galleries open onto an amazing garden filled with more than 1 200 exotic trees during the summer time. The central gallery is quite impressive at 156 meters long, 12 meters wide and over 13 meters high. The side galleries are 70m long. The Orangery is available for functions hosting up to 1200 guests for seated meals or 2 500 people for cocktails from May to October. Crusades Rooms are a collection of five rooms on the ground floor in the North Wing. These five rooms are designed in the neo-Gothic style. The largest of them is 250 square meters. Total capacity of the rooms allows them to welcome 180-200 people for seated meals or 300-400 people for cocktails. The pictures on the walls depict the major episodes in the Crusades as seen by the 19th century painters. The ceiling and pillars are decorated with coats-of-arms of the most illustrious crusaders. 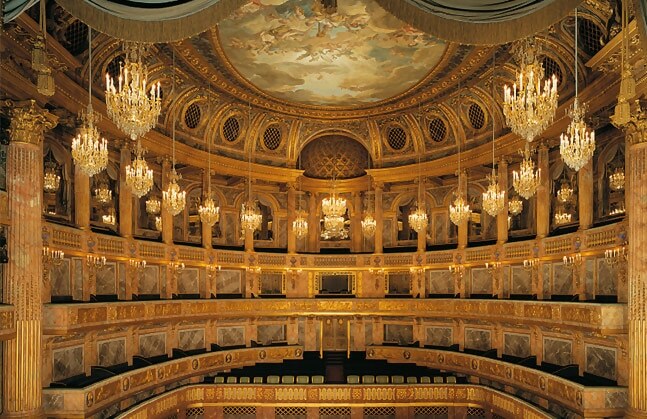 The Royal Opera is a perfect Versailles Place venue in case you plan to treat your guests with a special performance. Perfect acoustics, huge size of the stage and unique decoration created by the best painters and sculptors of eighteenth century make it one of the most beautiful theatres of the world. Host your exclusive music or dance show, ballet or theatrical performance in royal atmosphere. Opera is home to another technological innovation of its time, a mechanical device that allowed the orchestra pit to rise to the stage level, allowing it to be turned into a dance or banqueting hall. Trianon Palace Hotel is one more magnificent Versailles wedding hall a hundred steps outside the grounds of the Versailles Palace. It stands next to the Royal Park and Trianon Pavilion. 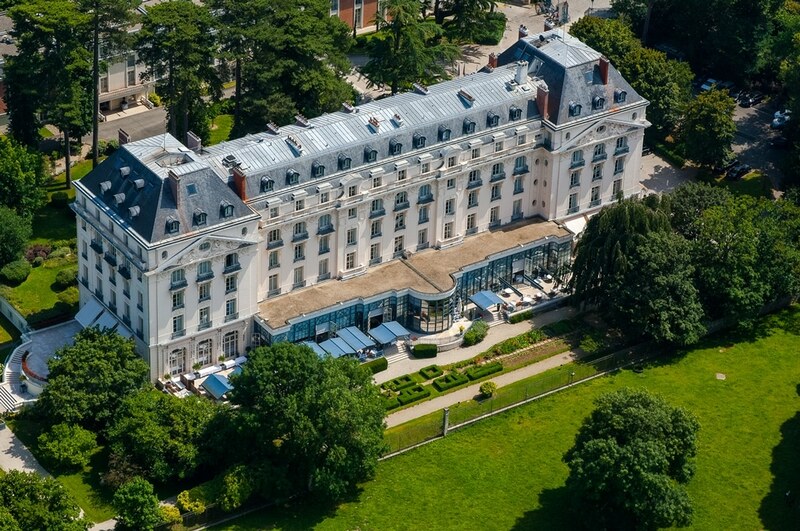 This exclusive hotel is part of the luxury Waldorf Astoria chain. It is nested in the middle of a beautiful park with century-old trees and blossoming flowerbeds. Interiors of the hotel were, in fact, created at the level of palace interiors. 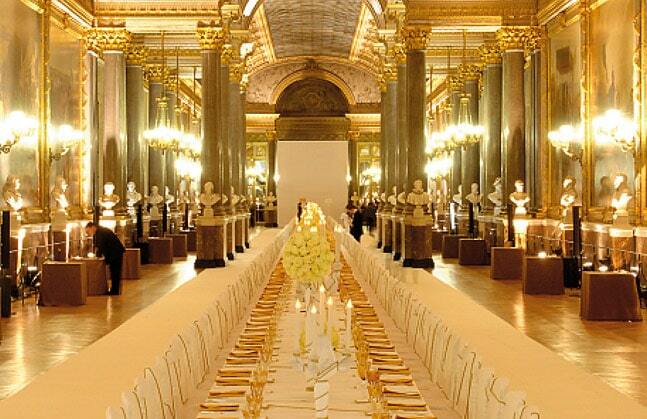 The Trianon Palace is a perfect venue to host a magnificent wedding in Versailles. The main ballroom suits best for large-scale celebrations, while one of 18 smaller salons will be a better match for intimate events. Palace of Versailles wedding cost will exceed 100 000 euro with optimal budgets starting at 200 000 euro. The venue rent itself varies from 18 000 euro for the Crusades Rooms to 70 000 euro for the Gallery of Battles or Orangerie. Considering the unique facilities of the Versailles Palace, it is highly recommended to opt for the additional services of operating fountains and fireworks. Magic Day has an extensive experience of large-scale firework shows produced together with the most renowned pyrotechnician companies of the world. Your wedding deserves the firework show worthy of kings. Together with our catering partners we create the menus exclusively tailored to your taste and preferences. Your Royal wedding in Versailles will become the once-in-a-lifetime celebration with Magic Day. Get in touch to start planning your Versailles wedding today.